SET OF 2- The spotlights conveniently come in a set of two! Buy a few sets and place them all around your porch, patio, or backyard. The bright glow of these LED lights will add an ambient touch to any outdoor space. 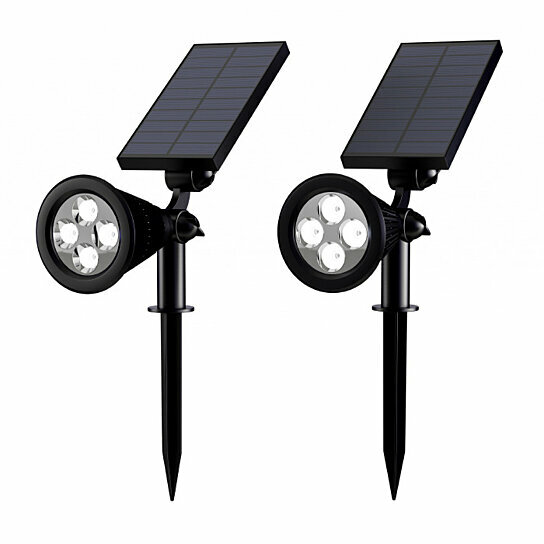 SOLAR POWERED- Equipped with a solar powered rechargeable battery, these lights are energy efficient and eco-friendly. Slide the switch to the ON position, set the lights in sunlight during the day, and it will automatically come on when it gets dark! LED BULBS- The 4 LED bulbs give off bright cool white light, and each light produces 50 lumens, making them a great option for your garden, porch, or patio! The spotlights also feature high and low settings, so you can get the brightness you want. EASY INSTALLATION- The included ground stakes or wall mount screws make it easy to secure the lights in your backyard, flowerbeds, around the pool, on your garage, or alongside your driveway or pathways. PRODUCT DETAILS- Materials: ABS Plastic. Dimensions: Overall Height-15.5�; Solar Panel-(W)3.5� x (H)5.5�; Stake-8�. 50 Lumens in each light, built in 18650 lithium battery 1000mAh, 3.7V. 2 Solar Lights, 2 Ground Stakes, 6 Plastic Anchors, 6 Screws.